You may remember a few weeks ago I told you about how I cleaned out my house using the Konmari Method, and how all this stuff was now piled up on my back patio. Well, we finally had our garage sale. Okay, I’ll clarify that a little bit. If you’ve never had a garage sale, I’m here to tell you they are a HELLUVA lot of work. Oh my goodness. Pricing everything, posting ads, hanging up signs, getting change from the bank, waking up before dawn to set up, and then sitting there all day in the heat while strangers paw through your personal belongings. It made me feel tired and WEIRD. Some of these things I thought FOR SURE would sell. We priced everything ROCK BOTTOM, but people still wanted to haggle over something marked 25 cents. It makes me feel kind of icky when something that I once valued so highly isn’t even worth 25 cents to someone. I’m telling you, it’s WEIRD! It’s also WEIRD to be held captive in your garage while people haggle over your stuff and then want to stand there and chat for half an hour. We met so many different and interesting people. There was the Air Force vet who bought my softball glove so he could play catch with the neighbor boy who was starting Little League. He told us several stories about serving in the Korean War. There was the elderly woman who showed up at my house a full hour before the sale started who was specifically interested in my vintage brooches. She then stayed for an hour and got to talking about baking bread with Adam. She came back on Sunday just to tell us that she had visited a local café we told her about that bakes fresh bread, and that they were making a loaf of rye special for her. I don’t know, that garage sale took a lot out of me. I think I may be out of commission for awhile. But we did sell some stuff and managed to make a couple hundred dollars, so it was worth it in the end, since it was going to be donated anyway. Have you ever had a garage sale? Did it make you feel weird, too? * – These were one of the first things to sell, purchased by a middle-aged man who didn’t buy anything else. I didn’t think anybody would buy them, I was surprised they went so fast. ** – Okay, they were BRAND NEW underwear, and some still had tags on but some didn’t. Adam thought it was gross that I was putting underwear in the garage sale, but I’m telling you, they were a hot commodity! I had over a dozen pairs for sale at $1 each and EVERY SINGLE PAIR sold. (And for those of you with dirty minds, it wasn’t like in “Orange Is The New Black,” I’m pretty sure all the women I sold the underwear to were planning on wearing them). *** – That 7 year old boy from across the street I was telling you about? Yeah, he convinced his mom to buy him the handcuffs. Luckily, several people were present to witness the event, especially because he thought they were $100, not $1, so he was carrying them around, shouting “These are $100?? !” like it was totally blowing his mind. **** – Don’t tell me you don’t have fur-lined handcuffs at your house, too. Okay, you might not sell them in your garage sale, but then you’d miss out on watching a young boy convince his mom that he HAD TO HAVE THEM. Back in May, I had the pleasure of escaping for a week to Colorado where I met up with Michelle, an old friend from college whom I had not seen in 20 years. My 40th birthday was looming on the horizon, and I had expressed many times that I’d like to welcome in this new chapter of my life with some quiet time for reflection and meditation. Michelle generously invited me to spend some time with her at her cabin in the mountains and then join her sister for a yoga/meditation retreat with SoulSpark Journeys in Steamboat Springs. I was game. Who could turn down such a thoughtful invitation? It was one of those more obvious examples of synchronicity in my life, for which I’m always on the lookout. I had put it out there into the universe that I wanted this experience, and the opportunity presented itself. Over the two days of the retreat, we were pampered with plenty of quiet time (holy cow do I love Yoga Nidra) and unbelievably tasty vegan and raw food (who knew?). But perhaps the most enlightening moments for me were spent in a workshop aptly named “Slow Down and Tune In.” I mean, that’s exactly why I was there. I was expecting two hours of mindful meditation, or something else equally as quiet. When we began the workshop, however, I was surprised to be greeted with a tall stack of magazines. 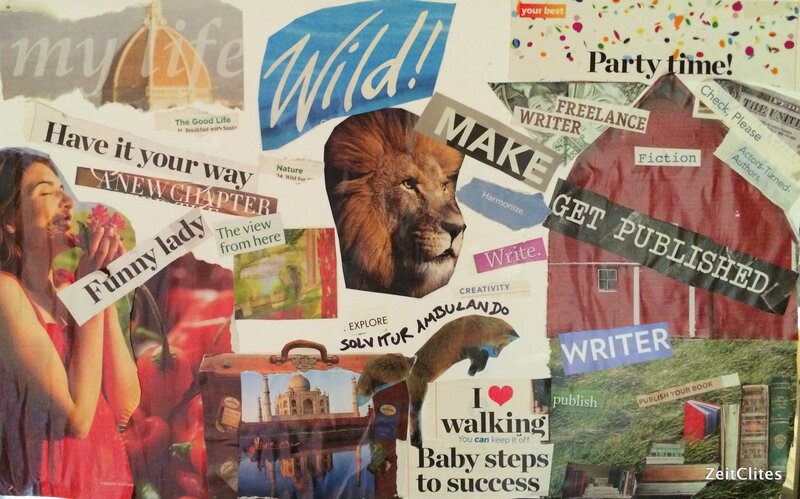 “Have you ever made a vision board?” our instructor, Alex, asked us. Although I’ve made plenty of vision boards in the past, I would never turn down the chance to make another. I LOVE ripping up magazines and gluing the pieces to poster board. It engages with my ever-hungry-for-more-messy-situations inner child. Plus – I think visions change over time. What we want right now might not be what we want tomorrow, or in a month, or in ten years. It’s worth taking the time to explore how our desires change. Heavy on the words, which is not insignificant given that many of my goals and aspirations have to do with being a successful writer. But it was the next step that threw me for a loop. Every time I’ve made a vision board, once the images are glued together, I stop. I admire my creation, hang it up in my office, and wait for the visions to arrive. But Alex asked us to take it a step further. Once we completed our vision board, she asked us to take 10 minutes to write about what we saw in it. It never occurred to me to do that before. And I’m a writer! Afterwards, those who wanted to showed us their vision boards and shared what they wrote. I think all of us were awed by the power and depth of feeling captured in each collage, and the poetry that resulted. That’s really the only thing you could call the words that the other women were sharing. It was all so spontaneous, yet all so deeply felt and richly recounted. I know I’m not the only one who got goose bumps that day. 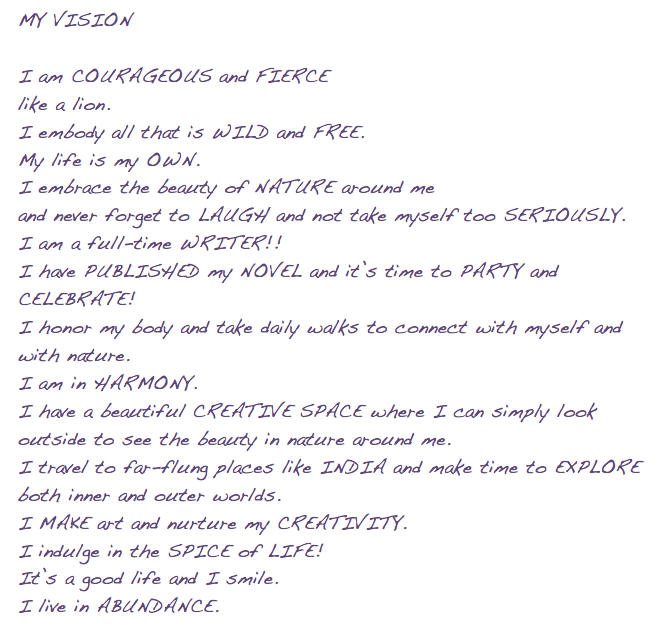 I challenge you to set aside an hour this week to make your own vision board and write about what you see. And I’d love for you to share it here with me, if you are so inclined. We need to give voice and space to these desires and visions of ours. It is the first step toward creating the life we have imagined. Go for it! My amazing friend Michelle owns a fantastic shop named Oak and Hawthorn. 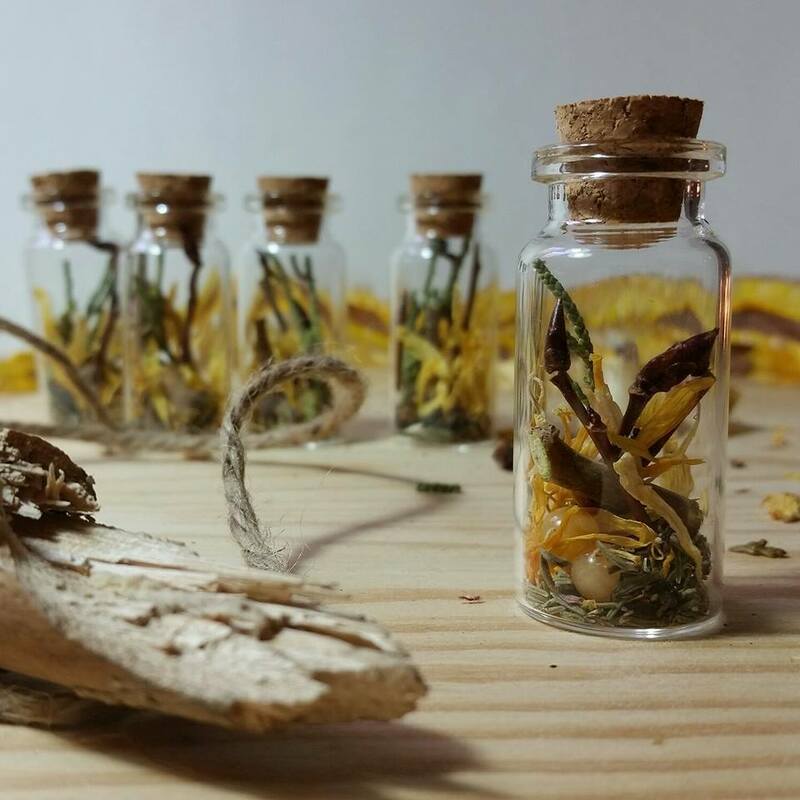 She specializes in plant magic and herb lore and makes gifts inspired by yoga, Ayurveda, Celtic mythology and the natural world. I highly recommend you check out her Etsy shop, Facebook page or blog. I’ve got a few of her medicine bags and chakra jars. It’s magical stuff. And if you live in Denver, she does house parties! Some of Oak and Hawthorn’s gorgeous chakra bottles. I’m 15 on the Inside. Are You? I’ve made a realization recently that makes it a little easier to come to terms with how I feel inside some days. I’m still a 15-year-old on the inside. Maybe that sounds like I’m emotionally stunted, but hear me out. I still feel all the same feelings I did when I was 15 – hurt, sadness, emptiness, joy, disappointment, hope, anger, fear. If anything, I feel all these things even more intensely. I still sometimes feel left out when friends or family are doing things without me. Although I also appreciate my solitude more now. I still feel disappointment when things don’t go as I had hoped, although I know now from experience that things have a way of working themselves out eventually. I get excited about dressing up for Halloween, or going to a party, or eating at a fancy restaurant, or going on vacation to someplace I’ve never been. I’m sad when a friend moves away, or somebody is sick and I can’t help them. I get frustrated with myself for not being more successful, for not being as confident as I’d like to be, for eating a donut for breakfast instead of oatmeal. I feel infinite when I listen to music sometimes, like I’m expanding far outside myself into the universe and into other people. Just maybe not as much as it did when I actually was 15. But when I do I appreciate it more and it has more meaning. I get angry at injustice, or being intentionally hurt, or seeing a friend get hurt. When I have no control over a bad situation. I have all the same feelings. I still feel like I’m 15 on the inside. But I’m 40 on the outside. It’s weird. My stepdaughter is 15. I’ve told her before, and I’ll probably say it to her again and again. How she feels on the inside right now? That’s how she’ll feel inside her whole life. The difference is that at 40, I have 25 years of experience of being 15 on the inside. These emotions are no longer surprising. Sometimes they are scary, and sometimes they hurt, but I know better how to deal with them. I am gentler with myself. I understand sometimes that my irritation is caused by hormones and I just have to give it a little time and I’ll feel better in a day or two. That sadness isn’t going to last forever. That pure joy is absolutely possible. I think it’s okay to feel 15 on the inside. I kind of like it. I think being a child inside is just about the best thing you can carry with you as you age. I still feel wonder at the world. I smile at butterflies and hummingbirds, like I’ve never seen one before when in fact I’ve seen thousands. I like to go outside and play. I like to act silly, or retreat into my room alone and cry sometimes. It’s all the same feelings. But I’m building a roadmap. I’m learning how they interact with each other, what causes them, how to encourage the ones that make me feel good and process and release the ones that don’t. I think it’s a lifelong job, making this map. But I like it. I’m glad. I’m giving that inner 15-year-old a hug right now. 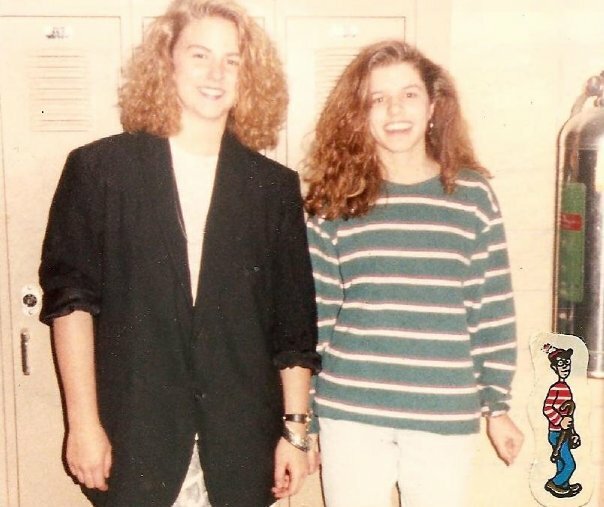 Here’s my 15-year-old self with my childhood best friend, Kim (who is still my childhood best friend at 40). And here I am on my 40th birthday in Sozopol, Bulgaria, feeling like a giddy 15 on the inside. Do you have a 15-year-old living inside of you?